Baobab | Infonet Biovision Home. Bajun (Muyu); Boni (Jah); Digo(Muuyu); Embu (Musemba), Giriama (Muuyu); Kamba (Muamba); Mbeere (Muramba); Swahili (Mbuyu), Taita (Mlamba); Tharaka (Muguna). 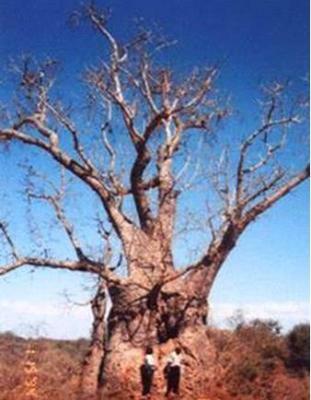 This is one of the longest living trees despite its soft wood; up to 3,000 years. It is also fire resistant. This tree has many myths and beliefs among many people in areas where it grows. These trees too many together may be problematic as they take too much space. It is common on red soils, sandy loam and in rocky areas; rainfall needs range from 300 - 900 mm annually on average; it can grow in altitude ranges of 0 - 1,300 m above sea level and in agroecological zones II - VI. Seedlings and direct sowing at site may be used for propagation. The tree should not be planted near houses; lateral roots may reach out over 100 m.
Food; dry pulp is eaten when raw, dry pulp dissolved in water, stirred to a milky taste (milk may be added), seeds sieved off and the juice used as a sauce or added to porridge, seeds are roasted like groundnuts, soft tuber like roots are cooked and eaten in times of famine, germinating seed root may be eaten, young leaves are used as vegetable, the pulp-coated seed (mabuyu) are coloured and sold as sweets. Fibre from the trunk produces a string for weaving baskets and ropes. Fodder; leaves, shoot and fruits are used as fodder. Roofing; its bark can be used for roofing. Soil conservation; the tree helps in holding the soil together and thus preventing soil erosion. There is no information on this. It is not a big problem. Maundu P. and Bo Tengnas. (2005). Useful trees and shrubs for Kenya, World Agroforestry Centre.